Brighton's Adam El-Abd is hoping his side can kick-start their season with a run of form at home after a stuttering start to their Championship campaign. The Seagulls have failed to win in six games but have four matches at the Amex in November, starting with the visit of Leeds on Friday and then Peterborough. 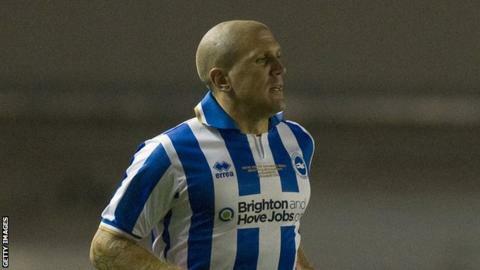 "It's a chance to put things right for what hasn't been the best of starts at home," El-Abd told BBC Sussex. "We've got to play better as a team in every aspect." The 28-year-old centre-back helped his side to a 1-1 draw with Blackpool on Saturday and admitted that the side were happy with the result given their current form. "The first half we didn't get going," he added. "Perhaps we were fortunate to go in at 0-0. "But taking everything into account, how we played away from home - against Blackpool, who are good at home - we'll take the point and get back down the road and try to improve our home form." The result left Brighton three points off the Championship play-off positions in 10th place.